Forel, A. (1901) VariŽtŽs myrmŽcologiques. Annales de la SociŽtŽ Entomologique de Belgique 45: 334-382. Total length of workers around 2 - 3.5 mm. Body color yellowish brown to blackish brown, dorsum of head and posterior half of gastral tergites sometimes a little darker. Antennal club 3-segmented. Mesonotal dorsum flat at the anterior half and lowered at the posterior half; margined posterolaterally. The whole of the pronotum and the mesonotal dorsum almost smooth, or with fine striae. Mesonotal pleuron wholly punctured. Metanotal groove distinctly impressed, not obscured by a lamella at the lateral border of its dorsum. Propodeal spines short, triangular in lateral view, each as long as the width of its base. Subpetiolar process hardly developed, not produced or spine-like. Petiole wider than long, the sides in dorsal view abruptly narrowed posteriorly. Postpetiolar dorsum essentially without, but sometimes with, a very shallow median furrow. C. matsumurai is distinguishable from other Japanese species because its propodeal spines are stout and short. This species nests under bark or rotting parts of trees and forages for honey dew. Reproductive alates fly from late July to September. Hokkaido (Sapporo and southwards), Honshu, Shikoku, Tsushima I., Kyushu; Korean Peninsula. VariŽtŽs myrmŽcologiques. Annales de la SociŽtŽ Entomologique de Belgique 45: 334-382. Emery, C. (1922). Hymenoptera, fam. Formicidae, subfam. Myrmicinae. . In P. Wytsman, ed., ""Genera Insectorum"", fasc. , 174B-C, 95-397, . Wheeler, W. M. (1928). Ants collected by Professor F. Silvestri in Japan and Korea. . Boll. Lab. Zool. Gen. Agrar. Portici, 21, 96-125. Wheeler, W. M. 1929. Some ants from China and Manchuria. Am. Mus. Novit., 361: 1-11. Fourmis du Japon et de Formose. Bulletin et Annales de la SociŽtŽ Entomologique de Belgique 77: 361-388. Onoyama, K. (1998). 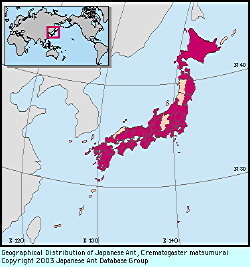 Taxonomic notes on the ant genus Crematogaster in Japan (Hymenoptera: Formicidae). 1: 227-232. Original text by Keiichi Onoyama and Masaaki Morisita. English translation by Keiichi Onoyama, edited by Robert W. Taylor. Revised by Masashi Yoshimura.